Posters will be on display throughout the conference and there will also be scheduled sessions when authors will stand by their posters to discuss them. Oral papers will be categorized into suitable topics and the presentation time will be 20 minutes including discussion. An overview of this year's posters can be found here [link]. 122 cm x 96 cm. You can attach your poster to the poster board with pushpins or clean removable tape. There will be pushpins available. If you want to use tape then please bring it yourself. The poster boards will be in the Bohr room and the Raman room. Please attach your poster to the board with your poster number. Please attach your poster to the poster boards as soon as you arrive at the conference. The posters will be up during the whole conference. You can take your poster down after the closing session on Friday afternoon (August, 27). 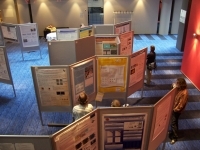 The poster sessions will be on Thursday afternoon (August, 26).